Green modular school buildings feature typical modular school construction, but are approached differently for more sustainable quality. They contain modern design modular school rooms, which provide a perfect educational environment. Green modular schools are energy efficient buildings, cutting the monthly expenses of a school building down the half. Additionaly, one of their biggest advantages in architectural sense is that they are intended to blend in with the location rather than requiring visible changes or large adaptations of the existing settings. Because of their adaptability and use of organic materials, they can be seen as permanent modular school buildings, which share the low construction cost with standard modular school rooms. Since green or the so-called prefab eco houses are designed for ecological and economical sustainability, you can easily spot the difference in the way they perform. Same is the case with green modular school buildings – you can expect much more smart innovations and eco-friendly solutions, previously unavailable in prefab building industry. There are several key features in green modular school room`s quality: first one is that they let plenty of natural light in, which results in better satisfaction and productivity of the students. The indoor air quality, acoustics and thermal properties in green modular school buildings are significantly improved, leading to a better health, friendly environment and better student performance. 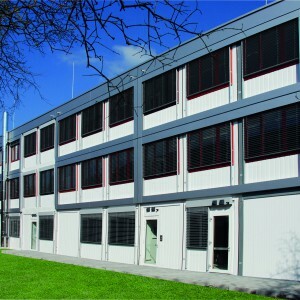 We are a dedicated prefab manufacturer, who continuously tries to improve the modular building concept. Our modular school rooms are made from finest materials, which guarantee long term durability and outstanding performance. We combine the prefab construction with traditional architectural elements, such as pitched roof, for greater comfort and appealing appearance. We offer large green modular school buildings, which provide safe and comfortable class attendance for any number of students. We also accept custom orders for specially designed modular schools – we`ll be happy to meet your requirements.